We’ve dealt with shower curtains featuring knife-wielding maniacs and an awkwardly staring Robert Pattinson, so for us to label a particular shower curtain as the creepiest one of its kind, that’s quite a feat. 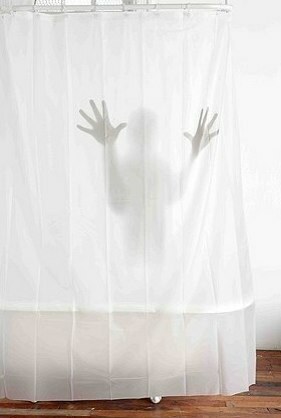 This curtain in particular features the silhouette of a mysterious shadow man, creating the illusion that someone awaits your arrival in the shower. Grab your own creepiness for $28. Just don’t be surprised if you see a second, more realistic shadow right next to the fake one. I couldn’t help but visit, I just love my readers so much! Call me old fashioned, but I’ll stick with a traditional shower curtain. This is just too creepy for me. I’m sure my grandson would love it though.